Reopened in the fall of 2014, Hotel Constance Pasadena offers the height of luxury for a California getaway, with property finishes emblematic of tranquil Mediterranean architecture. The hotel was originally constructed and opened in 1926 as The Constance Hotel. Since its renovation, Hotel Constance melds contemporary urban design and 21st century technology with classic early 20th century Mediterranean architecture. Offering 136 stunning guestrooms and suites, guests can choose among an array of room types, each affording modern aesthetics and state-of-the-art amenities. Guests can unwind within the hotel's lively bar or refined restaurant, each offering one-of-a-kind menus and delectable cocktails. Located within Pasadena's central business district, and adjacent to the Playhouse district, Hotel Constance Pasadena ensures that travelers are just steps away from each of the city's charming destinations including, The Huntington Library, The Norton Simon Museum, Pasadena Playhouse, Old Town Pasadena, and the Rose Bowl. Hotel Constance Pasadena affords visitors with a peaceful stay during their time exploring the vast array of Southern California cities. Featuring a modern design and tech-savvy amenities, the 136-guestroom historic boutique hotel offers a fresh approach to one of Pasadena's most recognizable historic buildings. 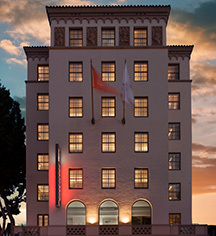 Hotel Constance Pasadena is a proud recipient of the 2015 Historic Preservation Award from the city of Pasadena. Hotel Constance Pasadena, a member of Historic Hotels Worldwide since 2016, dates back to 1926. 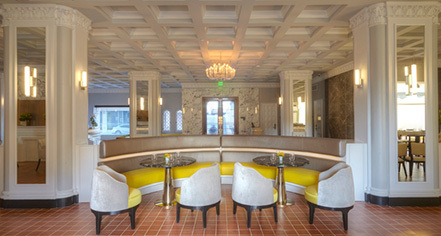 Both Hotel Constance and Perry's by Claud Beltran are named in honor of Pasadena's entrepreneur Constance Perry, the original developer of Hotel Constance. Early Check-In/Late Check-Out: Early check-in available for $20, late check-out available for $30. Rollaways: Available upon request; $25 fee. Payment: All payment types accepted. Pet Policy: $75 fee per pet; 35 pounds or less. Transportation: Town car service available upon request. Reopened in the fall of 2014, Hotel Constance Pasadena offers the height of luxury for a California getaway, with property finishes emblematic of tranquil Mediterranean architecture. The hotel was originally constructed and opened in 1926 as The Constance Hotel. Learn more about the History of Hotel Constance Pasadena .